Question: What is corneal topography? During my annual contact lens exam, my doctor charges an extra fee for corneal topography. What is corneal topography? Answer: Corneal topography is a procedure used to monitor and measure changes that may occur to the shape and integrity of the cornea of your eye. A corneal topographer projects a series of illuminated rings, referred to as a placido disc, onto the surface of the cornea, which are reflected back into the instrument. After analyzing the reflected rings of light, the computer generates a topographical map of the cornea. The images produced by the topographer can be helpful for your eye doctor when analyzing the health of your eyes. The transparent, dome-shaped tissue covering the iris and the pupil. The cornea provides 2/3 of the refracting power to the eye. The cornea is a remarkable piece of tissue made up of specialized cells. There are no blood vessels in the cornea to provide it nourishment. The cornea receives most of its nourishment directly from the tears on the surface and through the aqueous humor (a fluid that fills the anterior chamber of the eye) from inside the eye. Because the cornea is like a lens, it must be completely transparent and blood vessels would interfere with the focusing process. What does corneal topography reveal? Keratometry: Before computerized corneal topographers were invented, a keratometer was used to measure a small area in the central cornea. It gives the doctor two measurements about the steepness of the cornea. A keratometer is older technology but you will still find at least one in every doctor's office still today. However, corneal topography has revolutionized corneal shape analysis. 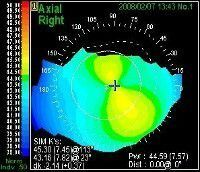 Instead of just measuring two points, a corneal topographer can measure hundreds and even thousands of data points to build a much more precise color map of the overall steepness of the eye in any location the doctor is interested in. A color map is generated showing steeper areas in read and flatter areas in blue. This is not only important in the overall shape but it will tell the doctor more precisely how much astigmatism you have. Elevation maps: Corneal topographers can also show elevation maps. Elevation maps help the doctor see unusual spots on the cornea that are unusually different from normal. Some software displays a 3-dimensional image that the doctor can rotate to get a better understanding of what may be occurring with the cornea. Contact lens fitting: Your eye doctor wants your contact lenses to fit your eyes as well as possible, and knowing the exact shape of your cornea is extremely important. Contact lenses that are too tight may constrict normal tear flow, creating an unhealthy environment for normal cell function. On the other hand, fitting a lens that is too loose may allow for excess movement of the lens on your eye, causing discomfort and possibly damage to the epithelial cells.Wearing contact lenses requires a great deal of responsibility, by you and by your doctor. You must be diligent in following proper cleaning routines and wearing schedules. Your doctor must closely monitor small changes in your eyes in order to avoid potentially serious contact related complications. Dry eye evaluation: Your tears are very complex. One of the jobs of the tear film is to produce a very smooth surface from which light will refract into the eye. Without the tears, there are many microscopic gaps in the surface of the cornea. This creates a very rough surface. The tears fill in all the gaps to make a smooth optical surface. If you have dry eyes, the surface will not be smooth and your vision will be blurry. It is similar to scratching up your lenses in your glasses. A corneal topographer will be able to show how rough the surface is and how a dry eye may be affecting your vision. Elliott, David B. Clinical Procedures in Primary Eye Care, Pp 115-116. Elsevier Limited, 2003.